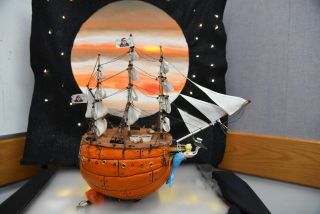 This Europa Clipper pumpkin display won NASA's annual pumpkin-carving contest this year. NASA held its seventh annual pumpkin-carving contest yesterday (Oct. 31) at the Jet Propulsion Laboratory (JPL) in Pasadena, California, where scientists and engineers competed to create the most geeky and spectacular pumpkin displays. The results are simply amazing. In a facility full of people who build spacecraft for a living, it's no surprise that NASA's pumpkin carvers came up with some pretty impressive pumpkin displays. Possibly the most outstanding pumpkin at JPL was a parachuting pumpkin built by a team of engineers who specialize in entry, descent and landing procedures for Mars rovers like Curiosity. With an air blower beneath the pumpkin, the parachute kept the gourd afloat. "It was like one of those indoor skydiving places," Pete Waydo, a mechanical engineer at JPL and a judge of the contest, told The Verge. "You could hang the pumpkin there on the parachute and it would free-fly indefinitely there." And last but certainly not least, here's one of the more relatable contest entries: a Halloween-themed model of the parking garage at JPL, which NASA engineer Aaron Yazzie described as "ever-frightening" in a Twitter post. Want to learn how to make pumpkins this cool? Check out our guide: Carve Like an Engineer: Halloween Pumpkin Design Advice from NASA's Jet Propulsion Lab.